Victor Rhyall, played by Cary Grant and his beautiful wife Lady Hilary Rhyall, played by Deborah Kerr lead a quiet and steady life in a big estate inside a mansion. Guided tours to the mansion were allowed in order to overcome their financial trouble. One such visit day, an oil tycoon Charles Delacro played by Robert Mitchum visits the place and accidently enters a private room of the Rhyalls. Although, Hilary tries to make him understand about the place being non-public, one can sense an attraction developing between the two by the conversations they indulge in. After some time, it is certain, Hilary is attracted to Charles and both wonder how they go about it next. Victor meets Charles and they both familiarise themselves over a cup of tea. Few days later, Hilary makes up a reason to meet Charles. Aware of what’s happening, Victor remains optimist about his love for his wife coming to his rescue. After spending few days with Charles, Hilary is surprised to see Victor acting normal in spite of knowing everything about her. He invites Charles to his place for a night out and also to settle scores with him and also to win back his wife. Victor and Charles carry out a lot of funny tests with guns and at pool table. Its funny. Hilary feels embarrassed over the entire situation and her behaviour being the main reason for all the unwanted drama. The movie ends when she realises and apologises to Victor, thus ending the short timed ‘Love Triangle’. 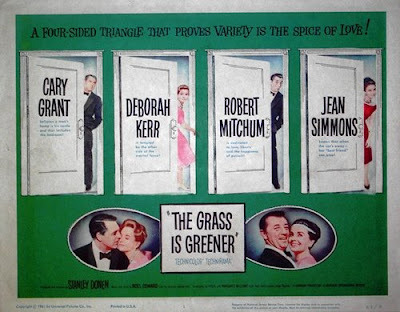 Released in 1960, The Grass is Greener was directed by Stanley Donen. This romantic comedy fared poorly at the box office in spite of having big stars on board. This also was the third association of Cary Grant and Deborah Kerr pair, previous two being An Affair to Remember and Dream Wife. 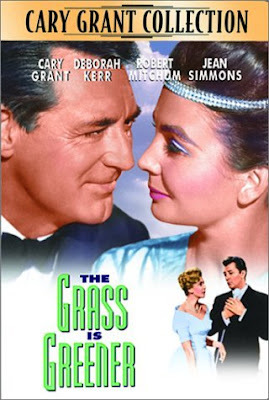 Jean Simmons plays the friend of Hilary and keeps the movie moving to believe its an quadrangular love story.